Irit Rabinowits was born in 1969 in Be’er Sheba, and currently resides, works and teaches in the Tel-Aviv, Israel area. She is a graduate of The Be’er-Sheba College of Visual Arts, where she studied from 1989 through to 1992 for a bachelor’s degree in the arts. 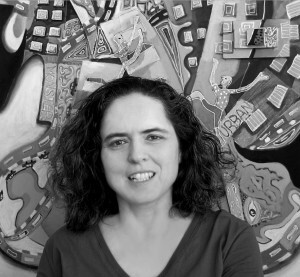 She spent 6 years as an assistant/apprentice to international artist David Gerstein, and 5 years as an assistant to known artist Leo Contini Lampronti, and has gone on to teach several art classes to the residents of Givatayim City. In 2015, one of her paintings, ”Amebeth”, has entered the everyday school curriculum and is currently taught alongside works by Reuven Rubin and Nahum Gutman, Israel’s national painters. 2015 Matkot – Yam/Jerusalem The Mormon University. © 2015 Irit Rabinowits All rights reserved.